Discovering that your dog has been sprayed by a skunk is one of the ultimate nightmares of pet ownership. There is nothing quite so offensive as freshly released skunk spray. If this happens to you, don’t worry, there is a light at the end of the tunnel! Stay calm, take a deep breath of fresh air (before you are no longer able to) and follow these instructions. First, check your dogs eyes, nose and mouth. 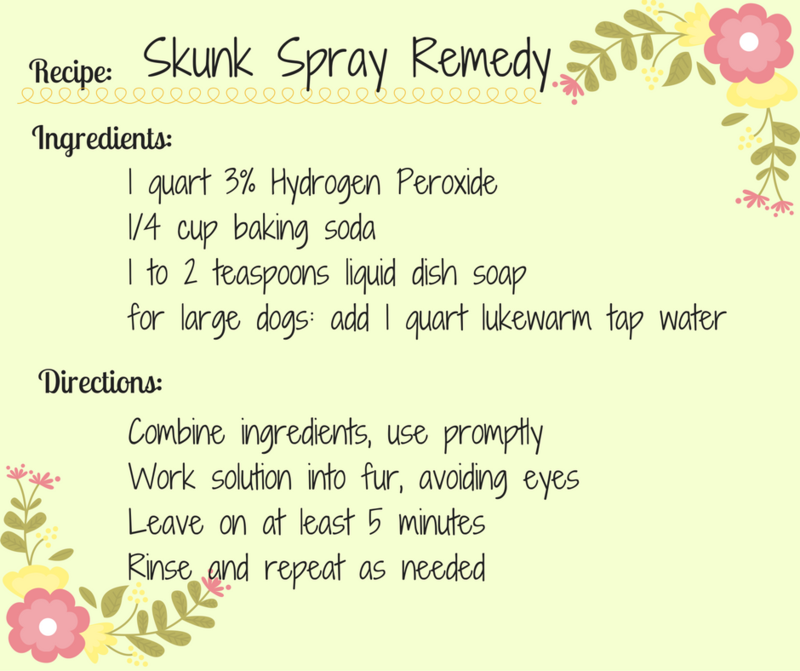 A skunk’s spray can be extremely irritating to mucous membranes. If possible, you’ll want to flush out your dog’s eyes with a saline ophthalmic rinse. Use a saline soaked cotton ball to clean out your dog’s nostrils and use water to gently rinse out your dog’s mouth. Don’t be surprised if your dog drools excessively, vomits, or sneezes repeatedly. Red, squinty or watering eyes are also to be expected. Do your best to prevent your dog from rubbing or scratching at their eyes! The TV show, Mythbusters, actually tested the most common skunk spray remedies and determined this DIY recipe is by far the most effective. It beat out the old stand-by, tomato juice, as well as well known over the counter skunk spray removal products. Besides being more effective, this recipe is also less expensive and made up of ingredients you probably already have at home. This probably goes without saying, but either bathe your dog outside or be sure to get him right into the bath tub! Don’t let him stop to rub on your furniture or carpeting along the way! Once you’ve finished bathing with the peroxide/baking soda/dish soap combination, follow up with a good lather of regular dog shampoo. Don’t store any leftover mixture for later use! It’s most effective when used immediately. Plus, if this mixture is kept in a sealed container, the pressure can build up to a dangerous level! Don’t panic. Being sprayed by a skunk does not generally constitute a medical emergency. You can ALWAYS call us for advice, or a little moral support, because trust us, we know how awful this experience is! If your dog’s eyes are excessively red or irritated, or squinting continues, it may be wise to have one of our doctors take a look. If your dog is bitten or scratched by the skunk, call us right away! We’ll help you make sure your dog is up to date on their Rabies vaccine. Depending on how long it’s been since your dog was last vaccinated, we may recommend a Rabies booster just to be on the safe side. If your dog vomits persistently, is lethargic, has a lack of appetite or just is not himself, give us a call. This recipe, and all of the accompanying tips do also apply to cats, but BE CAREFUL! A cat who tolerates being bathed is a rare entity. If you DO find yourself in the precarious position of having to bathe your cat, it may be helpful to use a smaller tub already partially filled with water, and a cup to rinse them with. Avoid using a spray nozzle, as this is more likely to scare your cat. Most importantly, be sure your bathroom door is closed!